The run-up to the local elections 2018 was a busy time for Tower Hamlets Wheelers. It included our hosting a lively and well-attended cycling and walking mayoral hustings, and we also published the Tower Hamlets Cycling Manifesto 2018–22: this set out our positive vision for cycling in the borough over the next four years, and six of the seven mayoral candidates (including the re-elected incumbent, John Biggs) committed to this. The Big Ride, promoting the LCC's Love London, Go Dutch campaign for safe streets for cycling, will meet in Hyde Park at 11.00am and aims to be a fabulous springtime day out in central London, suitable for all the family. The ride will end on Victoria Embankment around 2pm. The London Cycling Campaign has launched its Love London, Go Dutch campaign calling for the creation of the same kind of cycle and people-friendly streets that they have in the Netherlands. 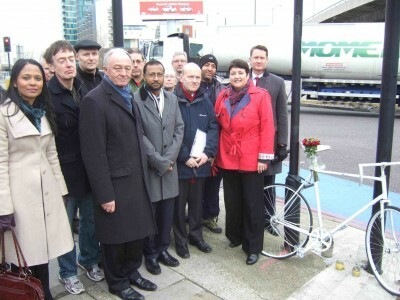 Ken Livingstone visited the Bow Roundabout on Monday 23rd January and met members of Tower Hamlets Wheelers and Tower Hamlets Cycling Club. Livingstone brought with him senior Labour politicians: our MPs, John Biggs, our London Assembly Member, and John’s colleague Val Shawcross – who sits for Lambeth and Southwark's on the London Assembly. Both Labour councillors for Bromley by Bow, as well as Josh Peck, Bow West and Labour leader attended.